It's a dangerous world, out there in the wild. Every animal has to have their self-defense mechanisms and some are more creative than others. There are the animals who simply hide themselves from the world by burrowing underground. It's quite effective until some animal comes along that also knows how to burrow and happens to have a hankering for a snack. Then there are the animals that saunter out in the open with a back full of quills or the ability to squirt a horrible stink, those beasts are animals that no one wants to encounter more than once! What if you're a big animal on the Serengeti, though? If an animal can't climb a tree, tunnel underground, and they aren't race car fast, how do they survive? Well, for one, a giant tusk as a nose is pretty intimidating to any would-be bullies. Owning the scene as a giant, sturdy, and armored creature is also a great way to keep the predators at bay. Rhinos know what's up. They hang out in the dangerous African plains with their tough skin keeping them protected from the sun and their hulking forms and sharp facial features keeping the lions at bay. They don't have to worry about much other than the many bugs of the savanna nibbling on their ears but that's where their buddies the birds come in! 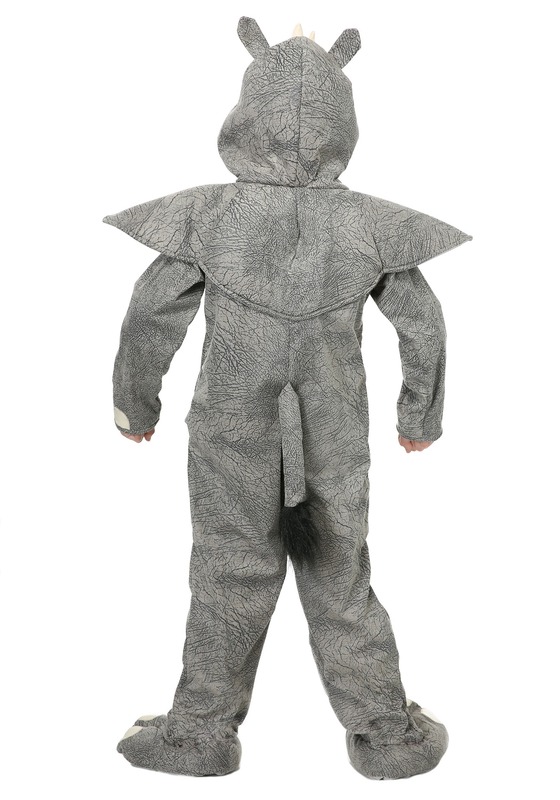 This Halloween, your child can celebrate the proud rhinoceros in this super cool hooded jumpsuit. If they couldn’t decide between animal and knight then they have found a compromise. 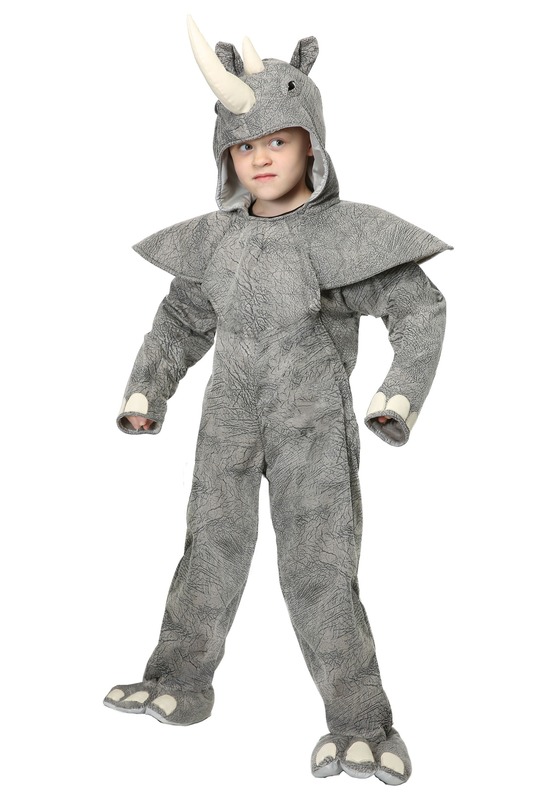 The grey jumpsuit is accented with large, armor-like shoulder pieces. The sleeves have white fingernail details on the sleeves and feet. Your child is sure to love the swishy tail in back and the dramatic horns on the top of the hood. 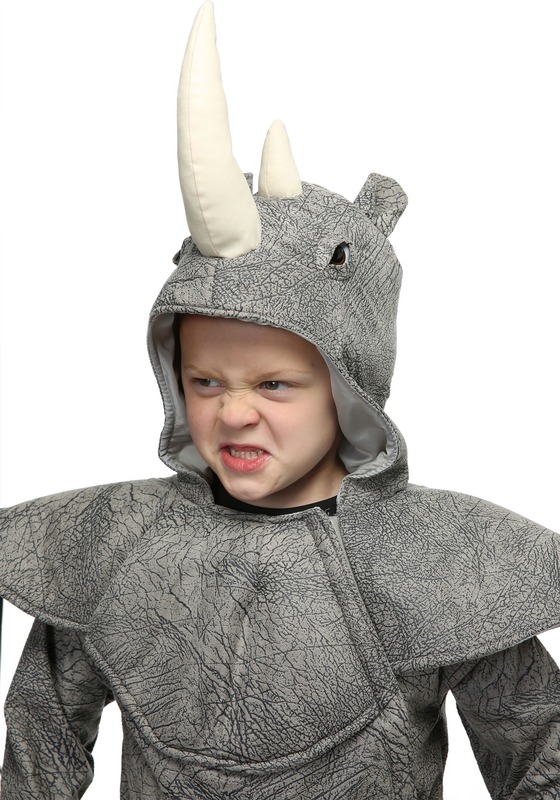 Sure, the wilds of Africa might be a dangerous place but this rhino is going to take the plains by storm!